Iowa Marquette is a dry red with complex aromas and flavors and spicy notes on the finish. Made entirely from Marquette grapes grown in our Mahaska County, Iowa, vineyards and fermented in stainless tanks and then aged in French oak for a year and neutral barrels for nine months, Iowa Marquette pairs well with grilled meat. Serve at room temperature. 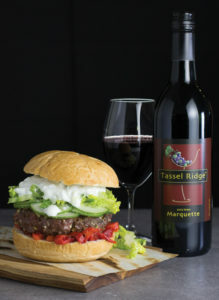 Tassel Ridge Iowa Marquette is available at the Winery and at some of our 400 plus retailers in Iowa. If you don’t see Iowa Marquette at your favorite store, ask the manager to get them for you.